Momma Told Me: Taste the season. When I was a young girl we'd overnight strawberries to my grandparents in Massachusetts. This might seem like a silly thing to do, but I've heard all too well the plight of over-priced, over-ripe, tiny strawberries on the East Coast. See, I grew up quite literally walking past the strawberry fields to school, and my little Southern California town is known as one of the strawberry capitals of the country. 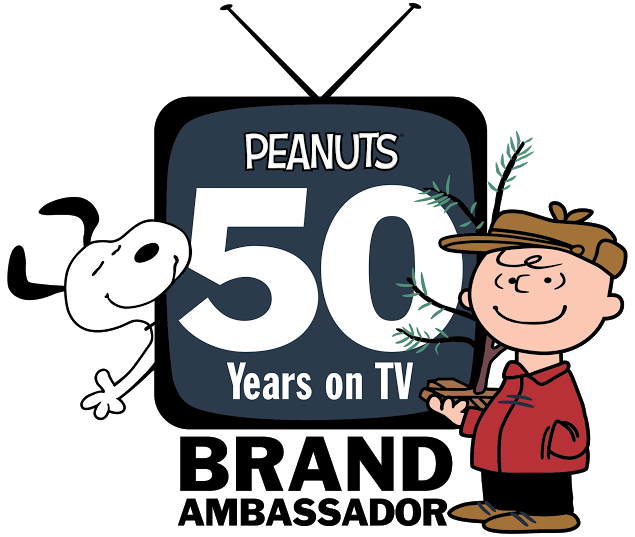 We even hold a massive strawberry festival each Spring. 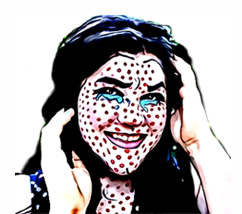 A life without fresh, ripe, dippable, bursting with flavor strawberries never occurred to me as I was painting my shirt, fingers, and face with strawberry juice as a child. I've had many tell me that my local strawberries are some of the best they've ever had. I suppose I take it for granted when I can walk to a stand several blocks from my house and pick up a fresh (picked that morning) flat for just $6. And for those not savvy with the market lingo- a flat is many many baskets- 8, to be exact. Yes, I know, you probably pay $5-6 for a pint even in season, if you live in a cold climate state. So what does all this have to do with anything? Am I just rubbing my beautiful berry fortune in your face? Well, yes, and no. 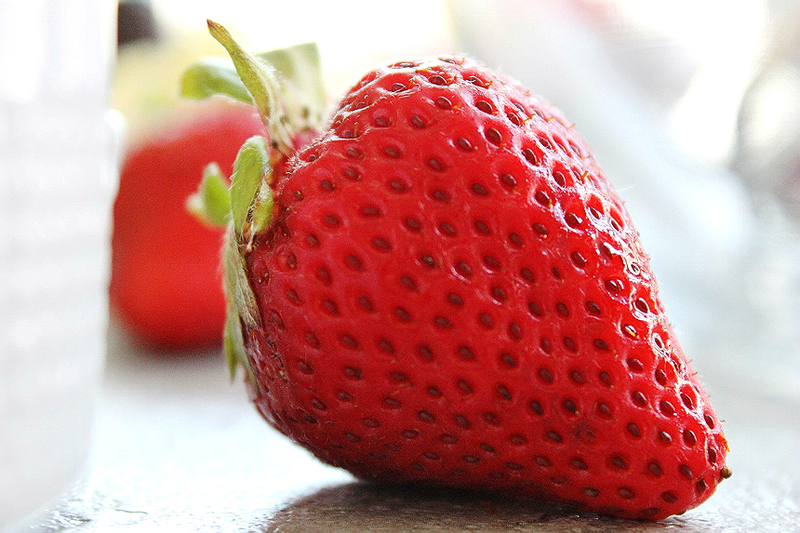 Strawberries simply are a staple here for most of the year. We don't have groves of fresh peaches, and the corn is often lacking, but every Spring and Summer we feast on the most beautiful, delicious, berries. And, with an entire flat on the kitchen counter, I come up with a lot of creative ways to serve and enjoy them. In the Summer anything frozen is a hit- But I try not to keep ice cream on hand- or it'll get eaten and, nobody needs that temptation around. 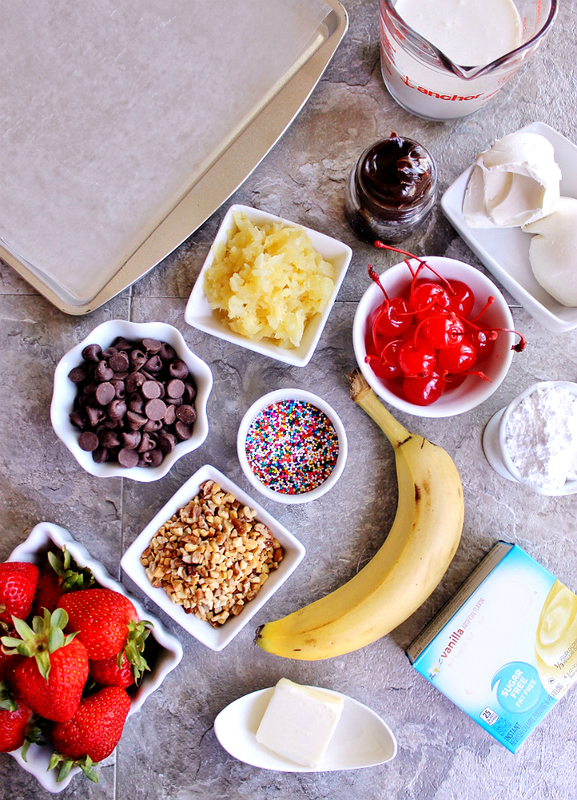 Needless to say, my favorite, banana splits, are reserved for ice cream parlors and special occasions. 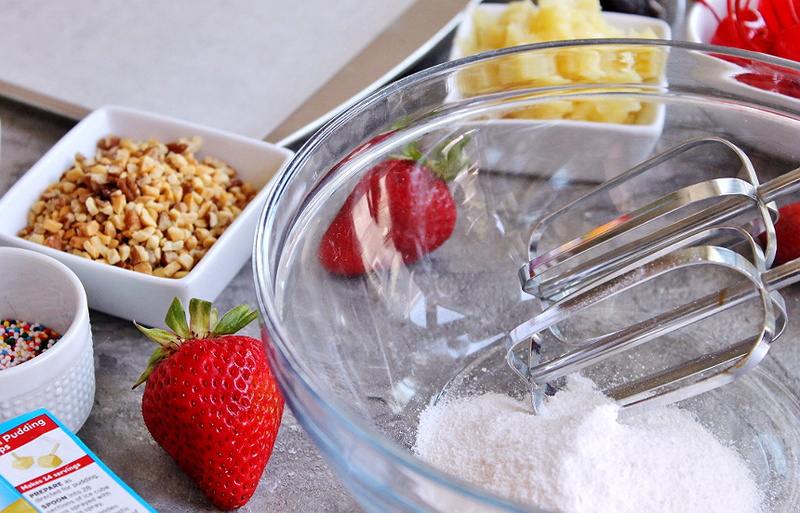 That's where the genius of these banana split strawberries come in- a healthier version of a classic treat in a single portion, bite sized package. They're especially great frozen and thawed at room temperature for 5 minutes, or served fresh at a Summer party. So this recipe, needless to say, is insanely simple, requires no baking, and can be made in about 30 minutes with some ingredients most people have on hand already. Since I'm watching my sugar, I even found a delicious sugar free pudding mix to use as the base for my pineapple banana filling- and it chills to the most wonderful texture, thanks to the artificial sweeteners. Of course anybody can core out strawberries and fill them with deliciousness- who am I to judge if you just straight up nozzle some whipped cream in the center and call it done? The sentiment is still there- banana splits IN strawberries. And these pack an adorable punch at that. But I do have to say, the creamy, fluffy, pudding filling is the perfect companion to the crunch of the chocolate dipped shell and the gooey chocolate fudge. Most recipes that require coring use a melon baller. Well, I don't own one, and most berries are going to be too small for one. I actually used a sturdy teaspoon measuring spoon to carefully carve out the center of my berries. It worked perfectly! 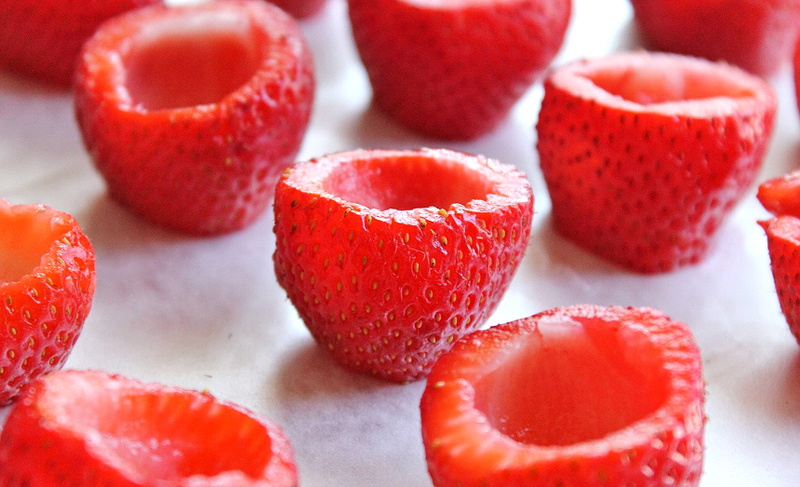 You'll also want to cut just the tip of the strawberries off to help them stand after being dipped. Be careful though, these will be top heavy when filled- when in doubt, cut a little extra off. The filling is thick and shouldn't leak or run through. 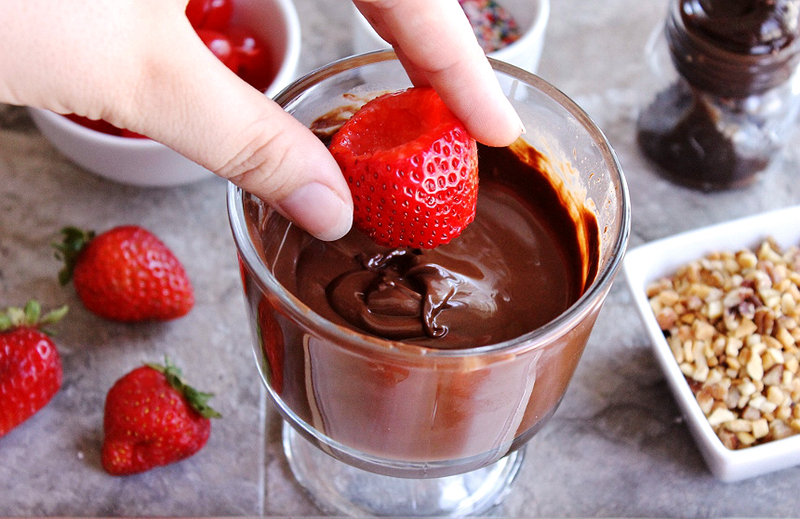 Who doesn't love a chocolate dipped strawberry? Well, those who don't like strawberries I suppose- but then, you wouldn't be reading this, would you? 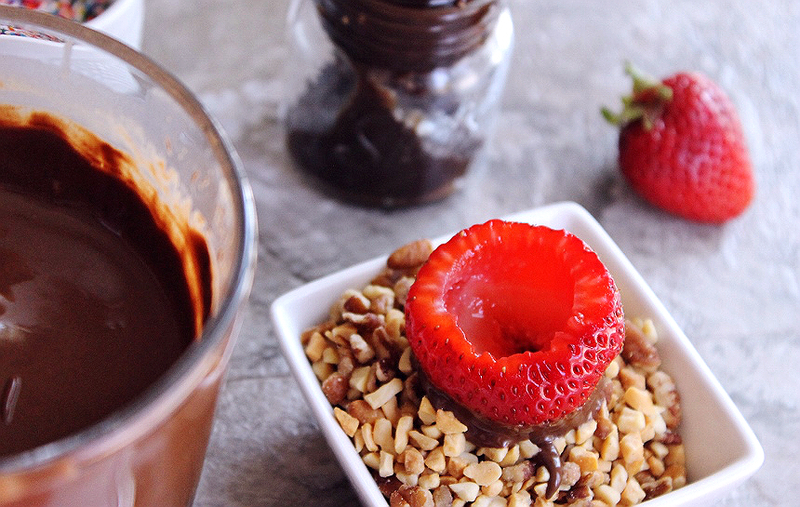 Prepare your gorgeous strawberry split vessels by dipping them in a thinned chocolate solution. I like to use a little bit of coconut oil, rather than butter, to give my chocolate a quick melting, even consistency. The trick is to get the chocolate just thin enough to begin running down the sides when you place it on your resting tray. A banana split isn't complete without all the trimmings, so you'll want to dip those chocolate dipped berries in some chopped nuts if you're a fan of the full split experience. Make sure you send your dipped, filled berries to the freezer for about 5 minutes to properly chill and set them before you move on the my favorite part- the hot fudge drizzle. Hot fudge, sprinkles, and a cherry on top complete the split experience and make these quite literally a bite of banana split at your fingertips! Every time I see one of these beauties it makes me smile and reminds me of wonderful childhood memories scarfing down a sundae or split in my pajamas on a Friday night. Even better, I can enjoy 1 or 2 in a sitting without feeling all the guilt of a heavy ice cream treat! So that's what I've been nomming on in my kitchen- Is there a seasonal fruit or veggie you have local that you just can't get enough of in the Summer? What Daughter Says: Strawberries mean Summer in my little hometown- and it just wouldn't be Summer without them! 1. 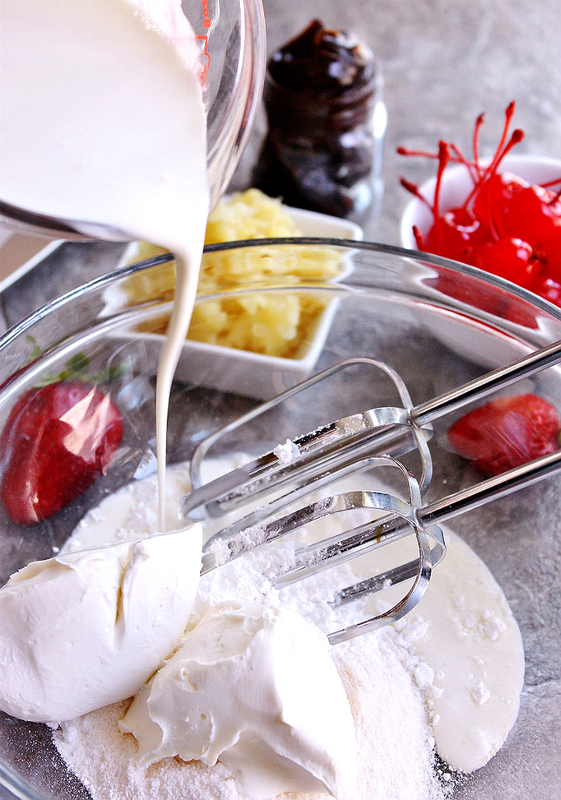 Combine heavy cream, cream cheese, and instant pudding in a medium bowl and mix on medium speed until thick and fluffy. Fold in bananas and pineapple and refrigerate. 2. Wash and dry strawberries. Cut off top and bottom, as to create a flat surface to stand the berry. Using a small TBS measuring spoon core out the center of each strawberry and stand them upright on a prepared cookie sheet. 3. Melt chocolate chips and coconut oil in the microwave on medium for 90 seconds. Stir until smooth and even. 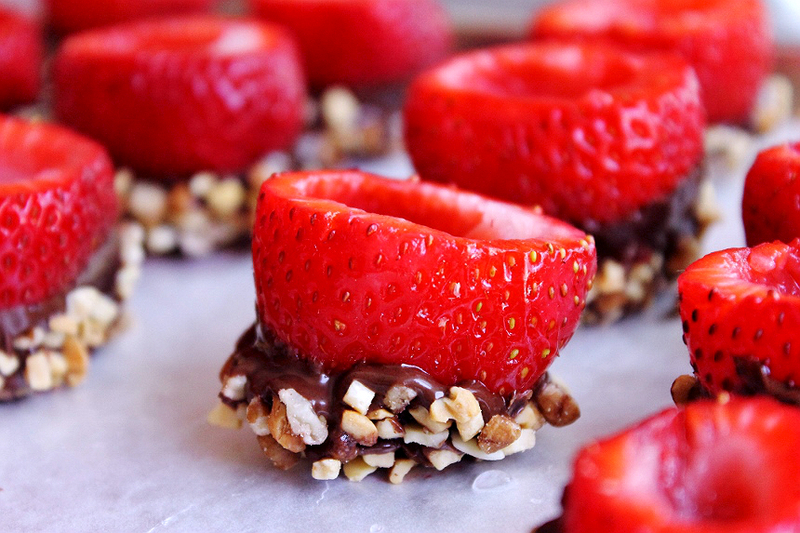 Dip the bottom of each strawberry in the chocolate and immediately into the nuts. Place dipped berries on a prepared parchment paper and freeze for 5 mins. 4. Remove berries from freezer and pipe generously with filling. Drizzle warmed hot fudge atop and top with sprinkles and a cherry. Serve fresh or freeze and thaw for 5 mins prior to serving for a frozen treat. YOU are killing me here, I should talk to someone to make me some of these! Seriously, such a brilliant idea!!! This would be the perfect dessert for my girl's night! Yummy and YES please!! These are *almost* too cute to actually eat...almost! Wow this looks amazing! It sounds like a perfect dessert for a hot summer day. These look amazing! I have to try them out soon. I know that my girls are going to love that too. 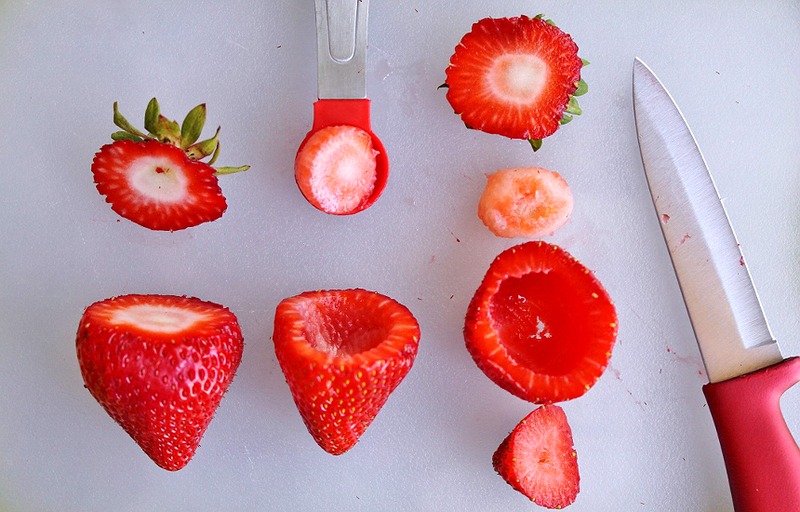 We love having strawberries, so this will be fun to make. Oh my gosh this looks amazing!! 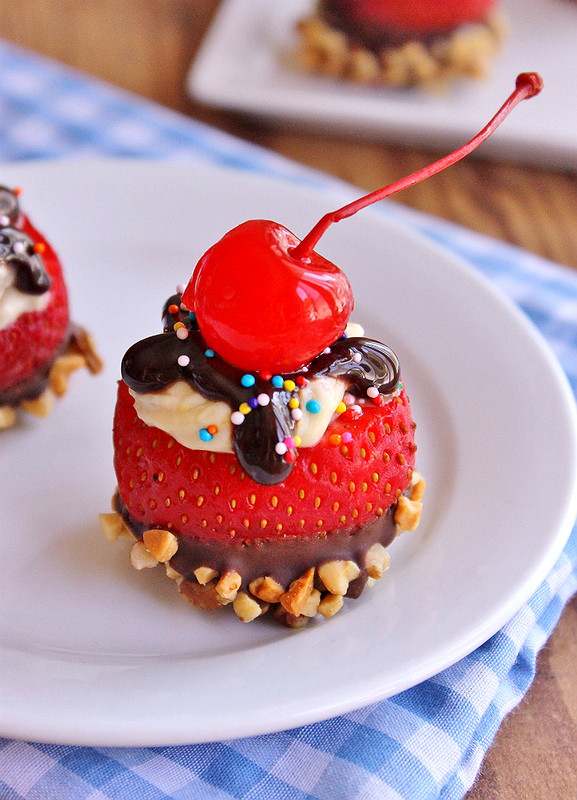 My girls are obsessed with strawberries and would love this treat! These look so delicious. 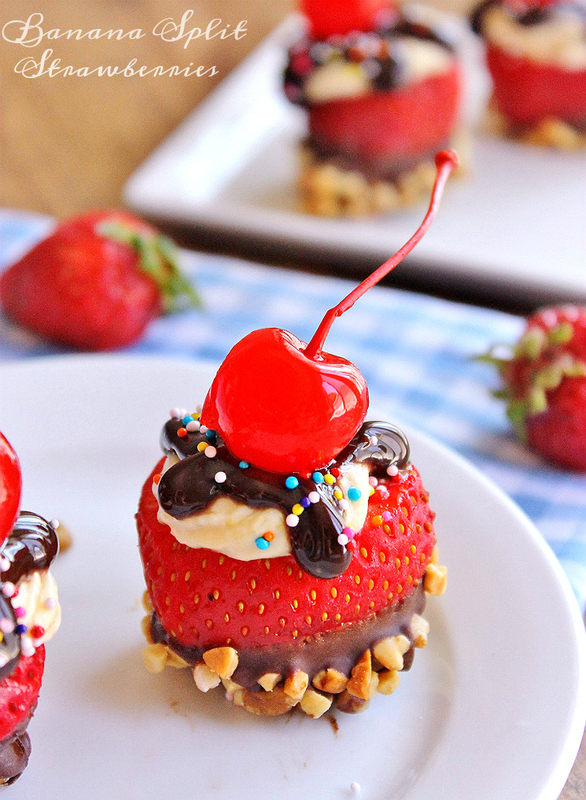 I love how everything from a banana split has been incorporated into this delectable treat. I love strawberries. Love the bite size! Can't wait to try your recipe! It looks soo good! What a fun treat! My boys would love these. 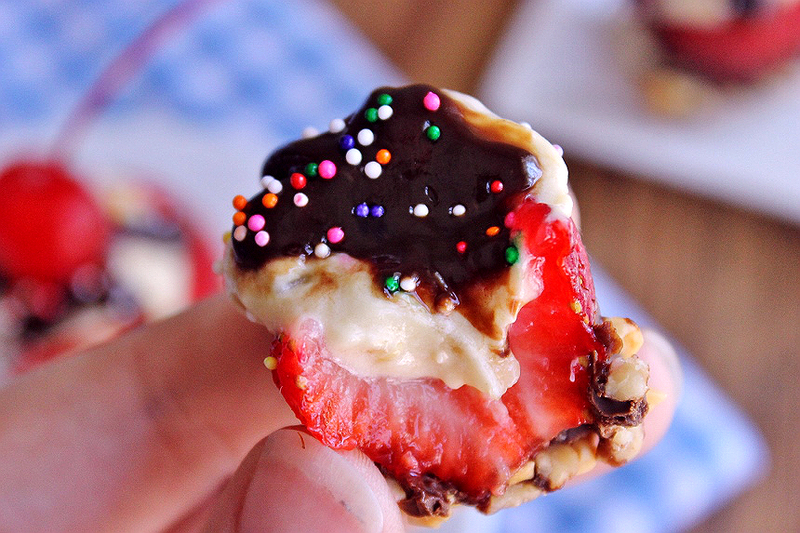 They like strawberries and with the addition of the sprinkles, chocolate and everything else they'd gobble them up! 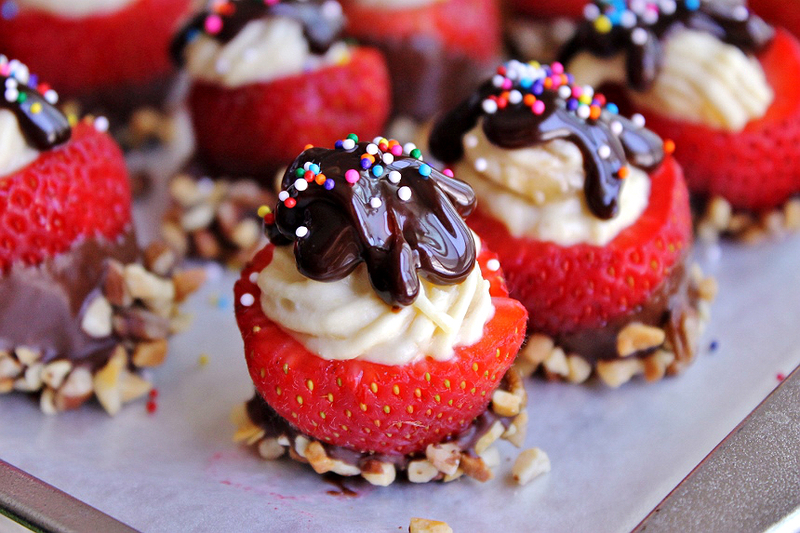 Oh my gosh these look delicious! Clever idea and they look fun to make too! Wow! 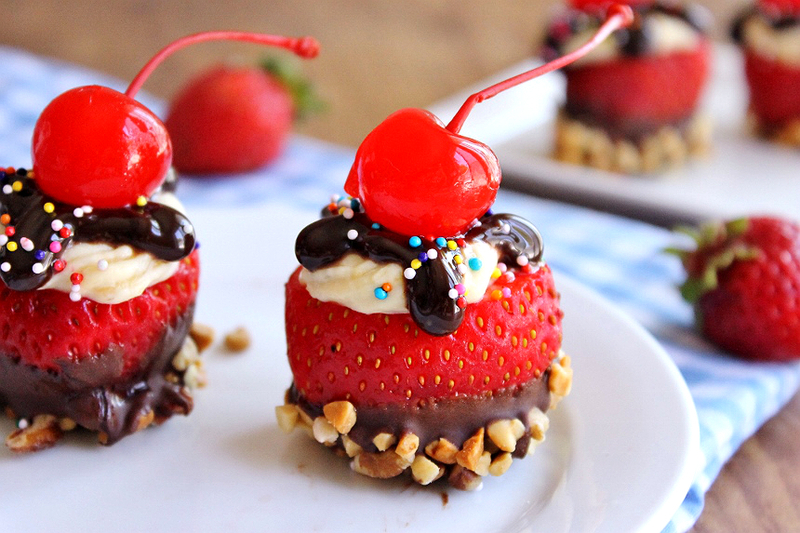 These are decadent and adorable! 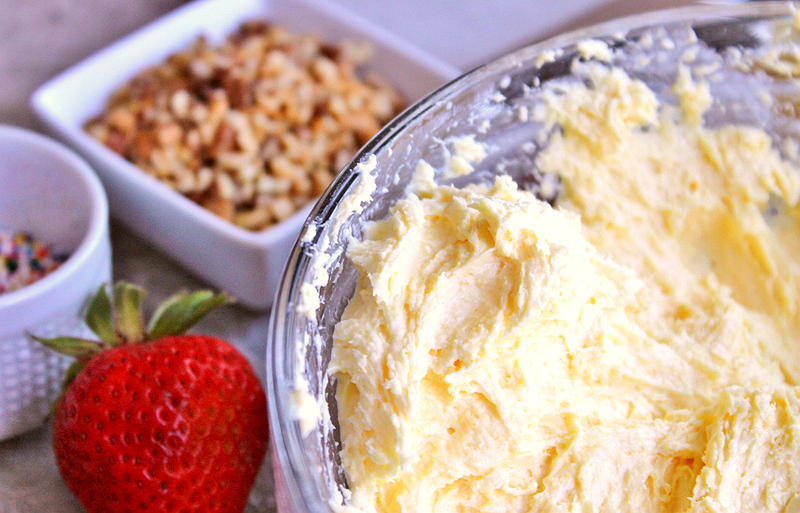 Would make for a great party dessert. 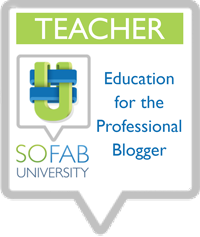 I absolutely love this idea! So making these on the weekend for our family get together. Thanks! Oh my goodness! 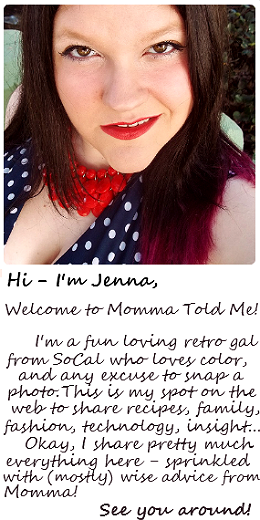 You had me at banana split! I am obsessed with strawberries, I will eat them in any way, but ice cream is my favorite! Super delicious recipe! I am so excited to give this recipe a try. It will be perfect for our BBQ this weekend. I am sure they will be a big hit. Could there be a more perfect individual dessert! I have never seen anything like this! Those look so good! You got a lot of really great pictures. I love how creative and colorful these banana split strawberries are, I totally want to make some now. This is a delicious and delicious menu and I want to eat it. It will be fresh.